Buffalo Wild Wings is celebrating the beginning of the football season with its first new creative in over 18 months. 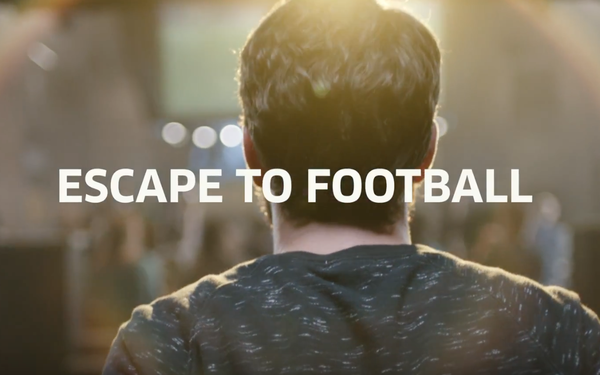 “Escape to Football,” which breaks today, was developed by Figliulo & Partners NYC and includes four TV spots that will run through the football season. The series of spots place characters in scenarios like being stuck late at the office, or taking a family photo where everyone's shouting suggestions (see below), only to ultimately escape to Buffalo Wild Wings. “We’ve all been there—it’s game day and we’re stranded somewhere, instead of watching the game live. It’s a painful, almost helpless feeling for any true fan,” said Seth Freeman, chief marketing officer, Buffalo Wild Wings, in a release. Creative features a refreshed logo with a softer, more neutral color palette and an updated drawing of a buffalo. B-Dubs is also launching a first-of-its-kind-partnership with DraftKings for an exclusive fantasy football game, “Blazin’ Fantasy Football,” only available to guests who are at a Buffalo Wild Wings restaurant on Sundays this fall, beginning Sept. 9. The contest is free to enter each week and offers multiple chances to win prizes like free wings for a year, Buffalo Wild Wings Gift Cards or Blazin’ Reward Points. There will be a total of 600 weekly winners. Buffalo Wild Wings is also the official presenting sponsor of DraftKings’ Thursday Night Showdown Series available to all DraftKings’ customers globally, where players can win cash prizes each week from a $10,000 prize pool. A football-focused menu will debut Sept. 6.